Today is Good Friday. For me, this means a day spent contemplating the goodness of a Lord who was willing to suffer so greatly to save those who would believe in him. I will spend the day in prayer and reverence. I will spend time in church and I will spend some time alone preparing for the Glory or our Risen Lord. I will also be fasting, this means that I will have 2 small meals and one larger meal with no snacks in between. I will be abstaining from meat as well. An easy way for me to do this is by making soup and bread for dinner. These Quick and Easy Garlic Knots are perfect alongside soup but they are equally as good accompanying your Easter Dinner or Brunch and the fact that they are ready to serve in less than 30 minutes is music to every harried cook's ears. We are still celebrating Easter Week with Holiday Fun with our Blog Friends , hosted by Christie of A Kitchen Hoor's Adventure. You will find links to more great recipes at the bottom of this post. I am also getting ready for National Garlic Day which is on April 19th. 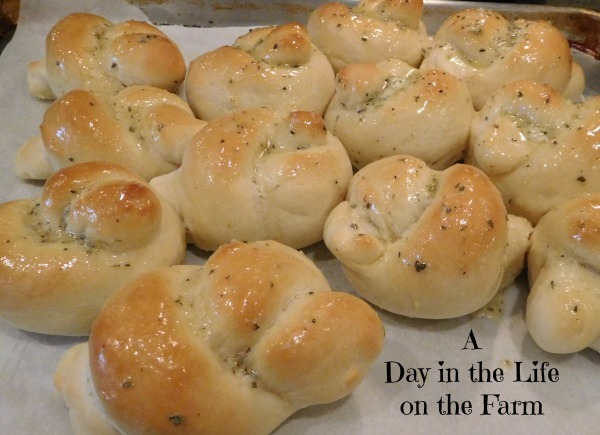 I, and six other lucky bloggers, were chosen to host a giveaway and share recipes for all things garlic. We are sharing garlicky goodness for a full six days. I found this recipe at a blog called I Heart Eating written by Kate while doing a Google search. I had never visited Kate's blog prior to this but I am very glad that I have found her. 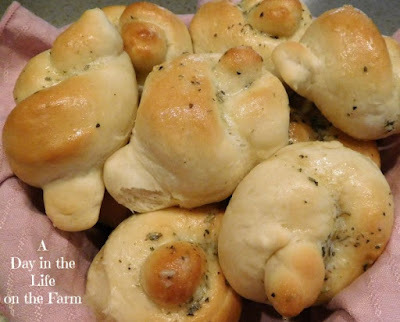 You will be too when you taste these amazing garlic knots that you can even make during the week after dinner if you get a hankering. I used garlic provided by Melissa's Produce and minced it using the Garject from Dreamfarm that is a garlic lover's dream come true. Six of our lucky readers will get an opportunity to win their very own garject. You can find details and enter the drawing here. I adapted the recipe a bit with the technique used to warm the milk and butter, using a microwave to get it to a temperature between 100*-110*. I used a stand mixer fitted with the paddle attachment for the mixing and switching to the dough hook for kneading. 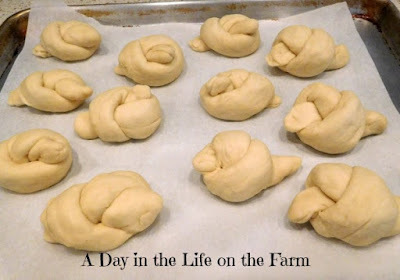 No need to let the dough rest before forming it into knots and placing them onto a parchment lined baking sheet. Once the dough is shaped you will allow it to rest while your oven preheats. They bake up in about 10 minutes to a beautiful golden brown. That is just enough time for you to put together the garlic butter. When they come out of the oven and are still piping hot just brush that butter generously over the knots and you are ready to serve. 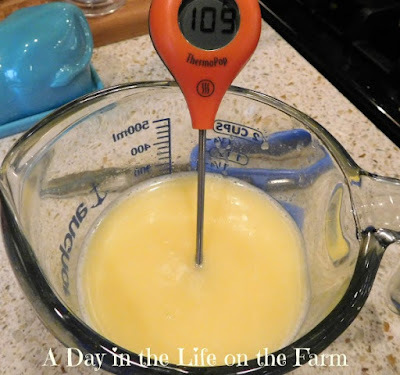 Place butter and milk into a 2 cup measuring cup and microwave in 30 second increments until butter melts and temperature reaches between 100*-110*. If the mixture gets too warm allow it to cool to the proper temperature before proceeding. Place the yeast and honey into the bottom of the large bowl of a stand mixer fitted with the paddle attachment. Add the warmed milk and stir to combine. Mix in salt and egg then add 2 1/2 c. of the flour mixing on low speed until combined. Add the remaining flour by half cup increments until the dough forms into a ball and cleans the sides of the bowl. Switch from the paddle to the dough hook and knead on med high speed for 2 minutes. 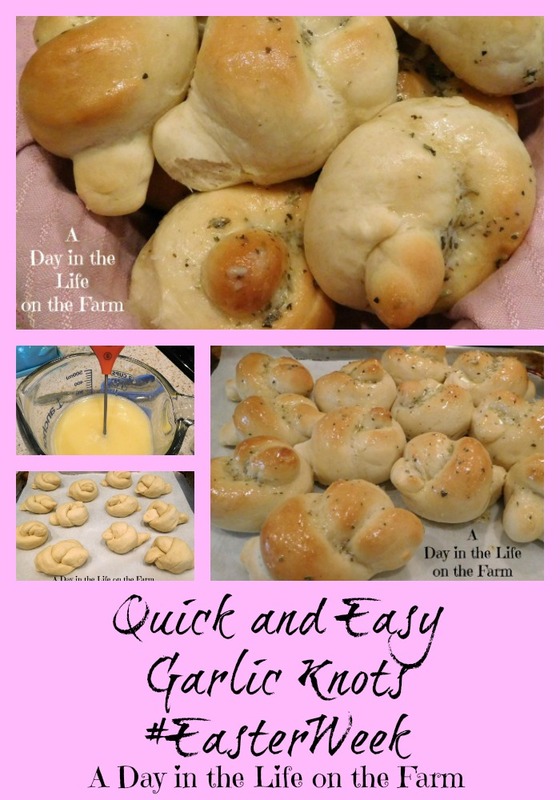 Divide the dough into 12 equal pieces and using floured hands form each piece into a knot. Place onto a baking sheet lined with parchment and let rest for 10-15 minutes while your oven preheats to 400*. Disclosure: I received complimentary items from Dreamfarm for the purpose of review and complimentary ingredients from Melissa's Produce for the purpose of recipe development. Dreamfarm also provided prizes for the rafflecopter free of charge. Comments are 100% accurate and 100% my own. I have received no additional compensation for these posts. Any excuse for garlic, for me - these look great and sure I'd happily have a few! And they are so quick and easy, there is no excuse not to indulge Caroline. Bonus garlic recipes!! I love it. I would never have thought to add the Italian seasoning mix into the garlic butter. YUMMY! It is yummy Kim....Happy Easter to you and yours. This is a fantastic recipe. Thank you for sharing it. They were soooooooo good Deb.